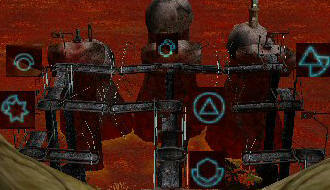 Gameplay: This is a game that is played using either the mouse (point and click) or the keyboard. The main menu shows the new and load game, settings, credits and quit. At the bottom of each menu page is a bar that explains the selection. The settings menu is where game, display, sound and control settings can be changed. At games settings, the option for hints and subtitles can be selected. At the display menu, the gamma correction, levels of details, resolution and anisotropic filtering can be set. The sound and music volume can be adjusted at the sound menu. The control menu has the walk speed, mouse sensitivity, mouse axis, and the keyboard functions are seen. The keyboard functions are W - forward, S - backward, A - left, D - right, spacebar for jump and enter for action. The mouse controls is forward using the right button and action for the left mouse button. The keyboard and mouse can be used interchangeably in the game. ESC accesses the menu page. Spacebar skips cutscenes. You are Beni, a young tomb robber. You are in the caverns of the legendary Tastan tombs. Only Ramirez has entered and come out alive from the infamous Tomb 35. Doba has Carrie, your sister in his control. Doba states that he will release Carrie only after you go through the first chamber of Tomb 35. You go down the elevator and face the path to tomb 35. Go forward (right mouse button) and automatically call out to Dormeuse, the Sentinel and tomb's defense program. Let's look around this place. Water level: Immediately turn left to the water level. 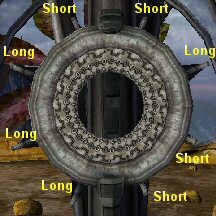 Go around until the pedestal at the end of the path, bypassing 2 inactive teleporters - one outside and one inside a room. The pedestal can not be accessed at the moment. Let's go back to the main path where we saw Dormeuse. Main path: At the main path, climb up the stairs and see a room with a glyph above the door, an upright triangle with a space on the right corner. Take note of the glyph. First level: Go back down and take the ramp in the right going up to the first level. See a snake on a square at the end. Enter the chamber on the right and see another inactive teleporter. Climb the stairs to lower balcony. Lower balcony: Another inactive teleporter is seen here. Continue inside and climb the ramp to the second level. Second level: See another room with a glyph above the door - remember this glyph also. Inside is another inactive teleporter. Climb the other ramp and see a window that looks over the tombs. Third level: See another room with a glyph above the door - remember this glyph too. Inside is another inactive teleporter. Note that the waystone dome on top of the stand has placements for crystals. We have to look for crystals to fit those slots. Teleporter stand: Go to the other side of the stand. Left mouse click on the buttons, to look close and activate the stand puzzle. The glyphs on the buttons are similar to the glyphs above the door of the rooms with the teleporters. Press the buttons to cycle the glyphs to show: third level glyph, second level glyph and main path glyph. The order is irrelevant as long as those 3 glyphs are seen. (Dennis). If done correctly, see the teleporters get active. Automatically have a conversation with Dormeuse. Hmm. The tomb can be her body or is it you that is created? Go forward to the room with the third level teleporter. Aim: The crystal in this world is accessed by reaching the ground level at the other side of the mountain. Step on the third level teleporter. Enter the world of Tregett. What are we supposed to do here? Let's look around this land of fens and marshes. The path on the right goes back to the tower ahead. Take the left path and look up. See a balcony up above the plant. Have another talk with Dormeuse. Balcony: Enter the platform and Dormeuse says that she was here for 2 years and kept a small piece of Tregett to show Beni. Electric thistle puzzle or how to get to top of tower elevator: There are 5 purple electric thistles in front of the tower. Left click on fan like stand to activate the puzzle. The stand has 2 sets of controls - a vertical at the center and a horizontal one on top. The vertical (top - down) control adjust the height of the tower. You can only move the controls to: a. 2 levels below the middle b. 3 levels above the middle c. 5 levels above the middle. The horizontal (left - right) adjust the tower to move right or left. You can only move the controls to: a. 2 positions to the right b. 3 positions on the left c. 5th position on the left of the frame. The thistles are different height and are spread around the tower. You need to set the tower to the correct height and to face the thistle so that it will activate that thistle. The object of the puzzle is to shine the light on every plant to power the elevator. The thistles will show sparks when activated. Solution: The blue button resets the puzzle. 1. On the vertical panel (top - down) - Click on the 3rd rectangle above the middle. On the horizontal panel (left - right) - click on the second rectangle right of middle. The 4th thistle is activated. 2. Vertical panel - click 2 down from middle. Horizontal panel - click on 2 right of middle. The fifth thistle is connected to 4th thistle. 3. Vertical panel - Click 2 down from middle. Horizontal panel - Click 3 left of middle. The 3 thistles on the right of tower are now activated and connected. 4. Vertical panel - Click on 5 up from middle. Horizontal panel - Click 5 left of middle. The leftmost thistle is activated. 5. Vertical panel - Click 2 down from middle. Horizontal panel - Click 2 right from middle. The second thistle is activated and power to the tower is activated. Did he just say - it's easy. See 3 fans turn around the base of the tower. Tower: Go down from the balcony and go to the tower. Go around the base of the tower and see buttons stand by the left and right fans. Either one of the buttons raises and lowers the platform to the top of the tower. Press a button to raise the platform. Blue lights special or how to get to top of mountain: There are 4 stands at the end of an incomplete bridge at one side of the tower. Each stand has 8 switches. Flip a switch to see red lights on the bridge. Toggling the flipped switch turns off the lights. The object of the puzzle is to make all lights blue using one switch on every panel. Solution A: Left mouse click the stand to activate the puzzle. Study the pattern of the lights lit up by all 8 switches on each stand. Label the stands L-R as 1-4. There might be a more logical solution to this puzzle but this is how I got it. 1. Look for a combination of one switch on stand 1 and stand 2 that produce 10 lights (red and yellow) on either side of the bridge. I found 3 combinations that produced this: (a) switch 2 on stand 1 and switch 1 on stand 2; (b) switch 8 on stand 1 and switch 3 on stand 2; (c) switch 3 on stand 1 and switch 6 on stand 2. 2. Then using one of the above 3 combinations, flip the switch on the 3rd panel to produce only yellow and blue lights. These eliminated 2 and 1 combination and 3 and 6 combination, leaving switch 8 on stand 1 and switch 3 on stand 2. 3. Working with switch 8 on stand 1 and switch 3 on stand 2, only switch 6 on stand 3 produces yellow and blue lights. 4. On the 4th stand on the right, with L-R, 8, 3 and 6 switches on the other (1-3) stands flipped up - find the panel that would light all blue. Solution B (Dennis): Note that each step can be lit only 3 times. Knowing this you can come to the conclusion that the correct switches have a pattern that has a 3 lights overlapping on ten steps for a total of 30 lights. BUT with 4 bases there is a possibility of a total of 40 lights. So to solve it you can find the 3 lights on each step (hard way) OR find the 1 light that's off on each step so that there is 30 on and 10 off. I took each base and with each switch I wrote down the steps that were NOT lit. This takes time but eliminates guess work. When your done just look for a pattern of steps missing from 1-10. These are the switches that prevent more then 3 lights on a step. Switch 8 on base 1 has steps 2,4,9 unlit; Switch 3 on base 2 has steps 6,8 unlit; Switch 6 on base 3 has steps 1,7 unlit; Switch 4 on base 4 has steps 3,5,10 unlit. this generates a pattern from 1-10 of UNLIT lights leaving each step to have 3 lit lights on each step. The bridge is now passable. 'She's playing with me. Must want me to see all of this'. Go forward across the bridge. Flower puzzle or how to get to ground level: See 3 flowers (poinsettia, I think) that rotates like windmills. Each flower has a lever in front of it that stops the rotation of the flowers. Go to the elevator at the center and see wheels with spikes on the posts. Each wheel has patterns inside the circle. The object of the puzzle is to match the patterns on the elevator with patterns on the sunflowers. Petal lengths are important. 1. Study the patterns on one wheel by the elevator. Look for the flower that has the pattern that matches that wheel. 2. Stop the flower's rotation by using the lever when the patterns are similarly positioned to the pattern on the wheel. Do this to all the wheels and flowers. 3. Copy the length of the petals on the flowers after stopping it's rotation correctly on the wheels by the elevator. When facing the elevator from the walkway, the back right wheel matches the flower that is front right. When facing the elevator, the back left wheel matches the flower that is back right. 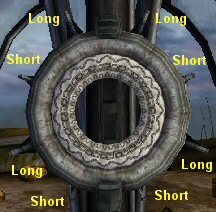 Go to the flowers and stop the flower's rotation by pulling the lever when the pattern match the wheel's pattern. Note the length of the petals of the flowers. Go back to the wheels. Pull or push the knobs surrounding the wheels to match the length of the petals of the flowers. When done correctly, pull back from last wheel and the elevator rises. Step on elevator platform. There is an inactive teleporter ahead. Go around the back side of the elevator and take the path to the small hill. Take the crystal at the center of the rotating rings. 'I'll take it back for Doba. It's like I've developed extra skills all of a sudden.' Go back to the teleporter and see that it is now active. Tomb 35: Go to second level activated teleporter. Step on teleporter. The crystal in this world is obtained by sound activating the satellites surrounding the tower. 'It's just a snapshot of the real thing'. Look around the tower and see the other floating structures in this mechanical city in the sky. Go down the ramp to the rotating walls. Rotating walls maze or how to get to tower elevator: The object of the puzzle is to make your way through labyrinth - rotating the walls with holographic buttons. 1. Press the red button 5 times. Enter through the opening on the wall. 'I can't let her win'. 2. Turn left and forward to the next button stand on the same maze ring. Push button once. 3. Go forward and push button three times (allowing an opening to pass). 4. Go forward, right, forward and out the other opening on the wall to the outer ring. 5. Go left to the other button stand. Press button twice (allowing an opening to pass). 6. Enter, right and see another button stand on the same ring. Press the button 5 times. 7. Enter the innermost ring of the maze. 'There Dormeuse. You won't stop me.' Step on the elevator at the center of the floor. 'It was a Science installation.' Go forward to outer rim of the top level of the tower. Dormeuse - Tamara starts a conversation. She agrees so far with all your motives except about bringing out something for Doba. Stations and sounds: Study the lights produced by the satellites seen through the telescopes and note the sounds produced by the button stand above each telescope. 1. Observe that there are 4 telescopes that can be focused on the satellites around the tower. 2. Look through each telescope. Each station flashes different colors. Note the different colors. As a side note see a Detalion ship flying around. 3. Climb the stairs beside each telescope. A stand is seen that has 6 buttons that produce different sounds. Colored Horn stands: Look for 6 horn stands with a colored light on top. Match the sound produced by the horn with the 6 buttons on the stand above the telescopes. 1. At top level, a horn stand with a green light on top is found at the inner ramp that surrounds the elevator. Pull the lever and hear a sound that matched a sound produced by second from top buttons on the 6 buttons stand above the telescope. 2. Go around the outer ramp and enter an elevator. Take the elevator to level II and walk around the ramp. 3. Find a horn stand with a blue light on top. Pull the lever and hear a sound similar to the third from top button of the buttons stand. 4. Enter one of the elevators again and go down to the level I. 5. Walk the inner ramp and see a pink-purple horn stand. Pull the lever and hear a sound similar to the bottom - 6th button of the buttons stand. 6. Go to the outer ramp and see a yellow horn stand. Pull the lever and hear a sound similar to the 4th from top button of the buttons stand. 7. 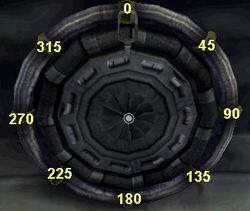 Find the elevator that is at the outer rim of this level. Take the elevator to the level I. It takes you to a floating platform. Talk to Tamara again. 8. Find the red horn stand that sounds like the first button of the buttons stand. There is also a white horn stand that sounds like the 5th from top of the buttons on the buttons stand. 9. Go back to the buttons stands on top of the tower via the elevator. Take the elevator back to the tower by pressing II. Enter an inner elevator to the III level. Color-Sound puzzle: Match the color sequences from the satellites with sound sequences played through big horns. 1. Go back to each buttons stand and press the buttons that match the colored lights sequence on the satellites seen through the telescope. 2. With each correct sequence of buttons pressed, the satellite matches the sound produced and a colored light is beamed from the top of the satellite to the center of the tower. The crystal is lowered a level. 3. Do all the satellites and buttons. Go to the center of the tower and take the crystal. The elevator goes down to the lowest level. 1. Go to the holographic button stand at next maze ring. 2. Turn right, forward and left to the holographic button stand at next maze ring. 3. Press the button on this holographic stand 4 times. 4. Go left and right to the inner maze ring. Left and out to the outer maze ring. 5. Go to next outer maze ring, left and out to the bridge ramp. Tomb 35: Go down to the main path and enter the third teleporter in the room with the glyph of an upright triangle with open right corner. The crystal in this world is accessed by completely activating the giant shell at the center of the water village. You have to find the 6 shells that control the giant shell. 'Domains are just sketches. I created enough of them to test you now.' It is necessary to look around this village above water to get clues on puzzles. Green numbers are the location of the rope puzzles based on the number of ropes in the puzzle. 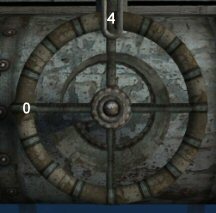 Red numbers are the locations of the clues to rope puzzles based on the number of ropes in the puzzle. Blue numbers are the locations of the shells based on the number of notches there are on the rods. Drawing is not to scale and is for reference only. Colored ropes: Go forward from the teleporter. Go left on the boardwalk, forward and see (L-R) red, purple and blue ropes hanging from a box at right of path. We need clues for this puzzle. Turn right and forward the boardwalk across the teleporter. See a box with 4 ropes (yellow, red, green and blue) hanging from it. Further down the boardwalk see blue, yellow, red, green and purple ropes hanging from another box. Shells: Turn left and forward inside the hut and see a shell on a stand. The shell has a rod sticking out of it with no notches on it. Shell puzzle: The object of the puzzle is to look for similar shells and press the buttons in correct order. There are 6 of these shells around the water village. Press the button on the shell in sequence based on the notches on the rod. This rod with no notch is the first of the six. Press the button and see water pour from the giant shell in the water. Keep an eye out for the rest of the shells. Go forward to the next hut and left to see a pipe on the right wall. Pipe puzzle: The object of the puzzle is to move the spine bridge to the center. The bridge stays on the right if you pour too less water, on the left if you pour too much water. Start with the largest valve to find the right amount of water. The pipe ends on a giant shell. In front of the shell is a lever. To the left is a spine bridge that needs to be adjusted so that we can cross to the other side. The pipe has 3 wheels. The wheels are marked with 16 lines-gradations. The start has an arrow at one end. The amount of water released increases as the wheel goes clockwise; which corresponds to the shape of the shell depicted inside the wheel. Above the wheels are drawings that show the size of the pipes that connects to the main pipe. The side pipes are controlled by the wheels. Solution: This is how I did this, a more logical explanation might be available: Turn the wheel, pull lever at end of bridge and see what the spine bridge does. 1. Based on the clue, start on the largest pipe which is the one on the right. Above the right wheel is a drawing of a large circle that has 9 lines. Click on the wheel's 9th line clockwise from the arrowed line. 2. Go to middle wheel. I selected a position-line-gradation going clockwise, pull the lever at end of bridge and see if there is a result shown by the spine bridge. With the large right wheel at line 9, I found that line-position 12 on the middle wheel keeps the spine bridge on the right (little water) while line-position 13 on the middle wheel moves the bridge to the left (too much water). Since we can add more water using the left wheel, click the middle wheel to the 12the line clockwise (little water). 3. Go to left wheel. This has the smallest pipe as shown by the drawing above the wheel and can add water in small increments. With right wheel at 9th line and the middle wheel at 12th line - Check which line will move the bridge to the center so you can cross. Click the left wheel to the 4th line clockwise. Note that the original position of the zero line of the wheel is under the U shape metal at top of the wheel and the thinnest part of the inner shell like object inside of the wheel is at the zero position. Click the correct line on the wheel. The wheel will bring that line under the U shape metal at top of wheel. Click on lever and see the spine bridge move to the center allowing you to cross. Cross the spine bridge after the completion of the pipe puzzle. On the left, see a 4 notched rod on a shell. Do not touch it yet. 4 ropes puzzle clue: Go right to the boardwalk, left over the net bridge and down to the next hut. See the 4 rope puzzle clue. Click on the rope and count how many clicks are needed to show the colors seen on the 4 roped box puzzle. From L-R: yellow -2 clicks, red - 3, green -0 and blue - 1. Tower and 1-notched shell: Exit the area, cross the spine bridge, go pass the pipes and left. Go left on the next long boardwalk. Climb the tower at the end. At the very top, see a shell with a 1 notched rod. Press the button. This should be after having pressed the 0 notched shell. See that water is coming out the top of the giant shell at center of village. 3 ropes puzzle clue: Go down from tower and go to the other end of this long boardwalk. Talk to Tamara again. On the wall of this enclosure is the clue for the 3 ropes puzzle. Click on the rope and count how many clicks are needed to show the colors seen on the 3 roped box puzzle. From L-R: red - 1, purple - 3 and blue - 1. 3 ropes puzzle: Go back to the 3 ropes puzzle close to the teleporter. Click on red rope once, the purple rope 3 times and the blue rope once. See a bridge rise from the water to gain access to the hut beside the puzzle. 2 notched shell: Cross the bridge after completion of the 3 ropes puzzle and click on the button of the 2 notched shell. This is after having pressed in sequence the 0 and 1 notched shells. See that more water is coming out the top of the giant shell at center of village. 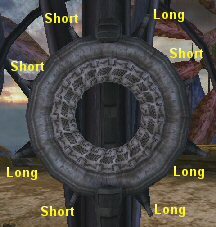 4 ropes puzzle: Go to the 4 ropes puzzle across the teleporter. Click from L-R: yellow -2, red - 3, green -0 and blue - 1. See a bridge rise from the water to gain access to the hut beside the puzzle. Go across this bridge and go forward until a raised hut on the left. Climb up and forward until a net bridge at the end. 5 ropes puzzle clue: Cross the net bridge and talk to Tamara again. After the talk, look at the 5 ropes clue on the wall. Click on the rope and count how many clicks are needed to show the colors seen on the 5 ropes box puzzle. From L-R: blue - 6, yellow - 2, red - 6, green - 5 and purple - 3. Go back to the boardwalk and continue further on to the next hut on the right. See the 5 notched shell. Do not touch it yet until you have done the 3 and 4 notched shells. 5 ropes puzzle: Go back to the 5 roped puzzle on the boardwalk across the teleporter. Click from L-R: blue - 6, yellow - 2, red - 6, green - 5 and purple - 3. See a bridge rise from the water to gain access to the hut beside the puzzle. 3 notched shell: Go across the bridge, left, forward and left to the hut with the 3 notched shell. Press the button on the shell. This is after having pressed in sequence the 0, 1, 2 notched shells. Press the button on the shell in sequence based on the notches on the rod. 0 shell - found at hut in front of the giant shell at center of village. 1 notched shell is found in the tower. 2 notched shell is found at the hut after completion of the 3 ropes puzzle. 3 notched shell is found at hut farther on after the completion of the 5 ropes puzzle. 4 notched shell is found at the platform after crossing the spine bridge. 5 notched shell is found at the hut farther down the boardwalk (see map) after completion of the 4 ropes puzzle. Shells completed: Time to do the rest of the shells. Go to the 4 notched shell across the spine bridge and press the button. Then go to the 5 notched shell via the 4 roped puzzle bridge. Go forward to the first hut on the right. Press the button on the 5 notched shell. Now all the 6 shell stands have been activated. A building comes out of the water and the windmill starts. See the crystal appear at outside wall. Take the crystal. Cross the newly risen bridge and forward to the teleporter. Tomb 35: Go back to the teleporter stand and crystal at top level. Note that the teleporters to the 3 worlds we went through are now gone and no other teleporter is active. Waystone: Click the waystone-big crystal on the teleporter stand and the 3 crystals collected are placed on the waystone. Dormeuse talks to you again - 'you might find your way out of here'. Look across the balcony. See that the lower balcony and lower level teleporters are activated. Go back down to the teleporter at lower balcony. The crystal in this world is obtained by accessing the volcanic pumps and identifying them with their corresponding lights. Listen to Dormeuse. Look around the lava encircled volcanic island. Look through the telescope and see glyphs marking bridge segments across the lava. Cross the bridge, go left and see that 4 of these outlying bridges with glyphs surround the island. A very active volcano is off shore. Talk to Dormeuse at one of the clearing. Building: Enter the central building-tower. Look around and note the drawing in the open book on the table. The crystal is behind a fence across the exit stairs. A giant wheel is on one side. Climb the stairs and stand on the ramp that has a red button stand. Press the red button and rise to the top of the tower. Summary: The main aim at Corabanti is to get the crystal in the building. The crystal is behind a gate. To lower the gate, the giant wheel inside the building must be turned. To turn the wheel there must be power. The power is derived from 5 volcanic pumps. There are 4 outlying sets of bridges surrounding the main island. At far end of those bridges are islands, one of which has a volcanic pump. You have to reach those pumps and turn them on. Puzzle one - Lava bridge puzzle is to get to the pumps. Puzzle 2 - volcanic pump puzzle is to turn on those pumps. 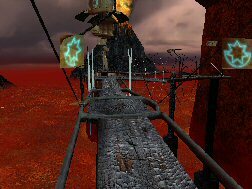 Tower: At the top of the tower, look out to the 4 lava bridges. At the center of the room is a console that has 4 panels of glyphs. Lava bridge puzzle: The object of the puzzle is to build paths to all 5 volcanic pumps. These paths rotate only when they can make a connection with an already built path. The central console has all the glyphs that are found on the lava bridges. Each glyph is found on a segment of the bridges outside. There are no duplicated glyphs on the bridges or on the console. You have to make a continuous bridge to reach the pump. Each outlying set of bridges are made up of bridge segments that are disarranged. Each bridge segment is labeled with a symbol. On top of the tower in the building is a console that turns those bridge segments based on the symbols that you can see through the telescope. 1. Study a group of bridges that you are going to connect by looking out the window. Plan a path from the start to the volcanic pump that looks like a tower on one of the outlying island. Make note whether the segment is straight or angled. 2. Go down, out of the building and go to the telescope to view the glyphs closer on the targeted bridges. Use the telescope and note-draw the glyphs that are on the bridges that you plan to rotate to make a path to the volcanic pump. 3. Go back up to the tower and start at the bridge segment closest to the main island. Using the console, look for the glyph for the segment you want to rotate. Press that glyph until you have turned the bridge segment according to your plan. Cycle the panel of glyphs using the arrow at the base of the panel. Turn the bridge segments as necessary until there is a path to the pump tower. 4. There are 5 pumps. The last pump is hidden behind the hill and is a continuation of the bridges that are left of the hill. Volcanic pump puzzles: The object of the puzzle is to place-frame the appropriate colored light on the pump's base. A volcanic pump is found on one of the outlying island off a set of bridges. 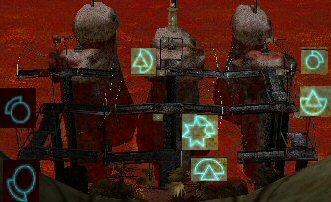 The volcanic pumps look like towers with 5 covered colored lights on the length of the base. At the base of the pump is a movable frame-window that shows the colored lights. In front of each pump is a wheel that raises or lowers the tower to show or hide the colored lights. 1. Inside the building is a book that gives a clue to what color is to be selected for the volcanic pumps at the end of the arranged bridges. The lines are the placement in the sequence, ex: 1 line blue means blue is in #1 position. 2. The position is from top to bottom, i.e. 1 is on top and the last one is the 5th position. It can also be done bottom to top i.e. 5 is on top and the last one is the 1st position (Dennis). 3. Go to each volcanic pump and move the wheel to see all the lights at the base of the pump. 4. Find the light that corresponds to the book clue's position and place it on the frame-window. Ex: If you move the wheel and see that the blue light is at top #1 position then place the frame-window to show the blue light. Once the volcanic pump colors are set, it is time to arrange the lava bridge to reach the 5th volcanic pump. 5th bridge arrangement and 5th volcanic pump: The object of the puzzle is to arrange the bridge segments left of the hill in order to access the 5th volcanic pump. The hill hides more bridge segments and the 5th volcanic pump. 1. Rearrange the 'left of the hill bridge segments to access the segments behind the hill. 2. Walk the bridge and see that 2 bridge segments behind the hill are not arranged for access to the 5th volcanic pump. 3. Study the 2 segments to see how many turns are needed for them to make a path to the pump. 4. Go to tower and move the unseen bridge segments using the console. Go down and check the segments. 5. When the path is completed, go to the 5th volcanic pump and place the red light that is in the 4th position on the frame. If all volcanic pump lights are placed correctly, see the wheel inside the building turn and the fence to the crystal goes down. Go the building and take the crystal. Go to the teleporter. Talk to Tamara. Hear her ask why an advanced civilization of millions that disappeared is replaced by a less sophisticated culture. Why are there only 85 Tastan tombs? Tomb 35: Look up and see the 3 crystals on the waystone projected as yellow lined circles on the ceiling. Go down and step on the activated teleporter by the stairs. The crystal in this world is found at the central base at ground level. 1. Teleporter island, where you first arrive has a mill and a totem. While facing inward the area, cross the bridge to the left. 2. Island A has totem on the left and a mill on the right. Cross the snow covered bridge. 3. Island B has Tower 1, 2 totems and a mill. Cross perimeter bridge. 4. Island C has a totem, Tower 2 and a mill. Cross the perimeter bridge. 5. Beacon Tower island has one totem. Cross the perimeter bridge. 6. Island D has Tower 3, 2 totems and a mill. 7. Island E has 2 totems, Tower 4 and 2 mills. 8. Central island: Cross the inner bridge from Island E and see a mill and a totem. See a manhole cover with marks on it. Look close and take note of the marks. 9. Bridge under Central Island has a totem. There are 4 towers. There are 8 small mills. 2 of those mills are associated with a tower. Each mill makes a sound when the circular mesh is clicked. There are brown totems that match the sounds of the mills. Each totem has glyphs. A. Find the mills associated with each tower. The clue here is found on the marking of the manhole cover at the central island. 1. Note that each tower has 3 single rotating wheels and a set of rotating wheels on the side. Each mill has 4 rotating wheels. Based on the clue on the manhole cover, they are associated from top to bottom. I only took note of the 3 top wheels. 2. While facing the tower, note the rotation of the wheels. The top and third wheel turns going up or going down hi. The second wheel goes left to right or right to left fg. 3. Go to the 8 mills. While facing the wheels and the circular sound mesh is at the rear, note the rotation of the wheels. 4. Match 2 mills to a tower. Tower 1 has similar rotation as mills at Island D and Central Island. Tower 2 has similar rotation as mills at Island B and one at Island E.
Tower 3 has similar rotation as mills at Island A and one at Island E.
Tower 4 has similar rotation as mills at Island C and Teleporter Island. B. Find the totems that match the mills. Find the totems that are associated with a mill based on the common sound produced. Note the glyph on the totems. 1. Click the circular mesh in front of each mill. Note the sound produced. 2. Go around the island to find the totem that has similar sound. Click on the totem to hear the sound. 2. Note the glyphs of the matching totem. 3. Do this until all the mills are matched to a totem. C. Go to each tower and enter the glyphs of the associated mills on the stand. 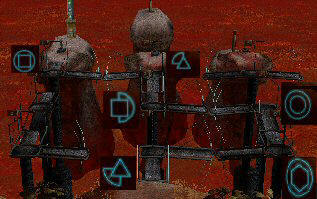 Click the tower stand to form the glyphs seen on the totem that match the sound of the associated mills. If correctly done, the elevators are activated. The object of the puzzle is to synchronize all the beams. All beams synchronized would release the piston and activate the elevator. There are 4 towers. There are 4 beams shot out from the beacon tower. Climb up any of the activated tower elevator. Go to the stand at end of the platform. 1. Look close at stand and see clasp all around the circle. The clasp when clicked on will activate the beacon tower to shoot a beam to the tower you are on. 2. Watch and note the beam shot out from a tower that you want to synch with. You have to synch the beam that is projected to the tower you are on with one of the beams shot from the beacon tower by clicking on one of the clasp. 3. Once one of the tower beam matches the one you are on - go to the next unmatched tower and match that beam to the 2 that you already synched. 4. Finally follow the same procedure for the last out of synch tower to match the 3 synched beam of the 3 towers. Once all 4 beams of the beacon tower are synched - you will see the result. Dennis: First, timing is not important here but you do have to understand that there are eight different positions that the beams can flash at. Think of it as a circle divide into segments of 45 degree's. Now if you press the first metal clasp on the rim of the wheel you advance the beam flash by 45 degrees. The second clasp advances the beam 90 degrees and the third 135 degrees and so on. Once you have selected the beam that you want to synchronize you can "judge" how many degrees your beam is away and select the appropriate clasp OR as just keep selecting the first clasp shifting it by 45 degree's until it is synchronized. Then move to the next tower and again "judging" the degree's off OR press the first clasp shifting 45 degree's until synchronized with the first two towers. Once the beams are in synch, the base of the beacon tower drops, the beams stop flashing and the manhole at the central island opens. Go to the central island and climb on the platform with railings - formerly the manhole. The platform goes down to ground level. Exit, walk to the left and around the rim of the enclosure. Pass under a tree root and face a metal door. Windows-Doors puzzle: The object of the puzzle is to line up windows first and then try to open the entrance. 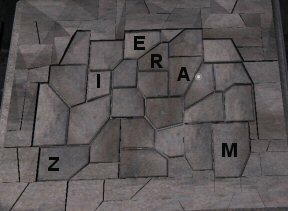 Activate the puzzle by clicking on the stone stand in front of the door. Rotate the wheel and see that there are metal panels, a window and a door that are cycled in the opening. The knob on the right adjusts the layer of the cycling panels. The bottom position of the knob is the closest layer and the top position of the knob is the farthest layer. 1. With the knob at lowest position, click on the wheel to get the glass window. NOTE: Be sure to note that windows have middle metal bars while doors have top bars. 2. Click the knob to the next highest position. 3. Click the wheel to get the next layer of glass window, so that now 2 windows are aligned. 4. Do this until 4 glass windows with middle metal bars are aligned. The knob should be on the second from top position. 5. Click the knob to the top position. 6. Turn the wheel to get the door with top metal bars in view. 7. Lower the knob to the second from top position and cycle the wheel to get the door. 8. Do this until the door is the closest layer. Enter the building and talk to Tamara. The average lifespan is now ~550 yrs and the tombs were designed as traps. Take the crystal. Exit the building ride the elevator and go to the teleporter. Tomb 35: Poor Carrie! Go to the lower level and stand on the transporter left of the platform. The crystal in this world appears only after accessing the bottom central level. Wow! We're underwater! Look around and enjoy the turtles and whale songs. 'What about those 85 that didn't become you? Because it matters!' She wants us to study each level. Go forward and enter the tower. Look up and see that we are at the 6th level - floor 0. See a central stand with 4 levers and 0-5 numbers on the right panel of the set up. Drawbridges puzzle: The object of the puzzle is to open your way to the lowest level by lowering appropriate drawbridges. Find out which lever lowers a gate to the platform and which lever lowers the drawbridge. Click on the #5 button to go to the very top. Look around at the conservatory. Look down the railing and see that each level has a walkway. The end of the walkway has a drawbridge (can't be seen now) that prevents access to the next level. Go to each successive floor via the elevator and pull a lever and see if it is the lever that lowers the drawbridge. This is done by going up to the top-5th floor after pulling a lever and see if the drawbridge has been lowered. Once that lever is determined - Then pull the other levers to see if it is the correct lever to open the next level walkway. Again check if it is the correct lever by going up to the top-5th floor, walk the walkway and see if the next level is accessible. This puzzle tired me out but I needed the exercise. 5th floor: L-R, pull lever 2. This opens the gate to access the walkway. Enter the elevator. 4th floor: Pull levers 3 and 4. 3rd floor: Pull levers 1 and 4. 2nd floor: Pull levers 1 and 2. 1st level: Pull lever 3. Go back to the 5th floor. Go to the walkway and walk down to the lowest level. 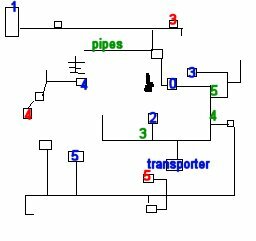 Lowest level: Go around the outer path and see 12 control stands with a switch and a lever. There is a stand that is covered by a plastic hood. Across this covered stand on the inner platform are 2 pumps, each with a light on a rod. There's a floating bridge on the moat that separates the outer path where you are to the inner platform. Raise the bridge: The aim of the puzzle is to raise the water level so that you can use the bridge to go to the central area. Flip a switch on one of the control stands and see that one of the 2 pumps lights up. The clue states two pumps make water level too high. Exactly seven levels are all you need to start. 1. Find the stands to use. Since we need only one pump to use, turn the knob on (my, how big that knob is) and check which stand is connected to which pump. The light will come on one of the 2 pumps at the central area. Turn the knob off and go to the next stand on the left. Left pump is lit by: Stands 1, 3, 5, 6, 8, 9, 11. Right pump is lit by: Stands 2, 4, 7, 10, 12. 2. Since we need 7 levels of water - pull the levers of stands (going left from the covered stand) - 1, 3, 5, 6, 8, 9, 11. This opens the plastic cover of the stand with the tremendously big lever. Pull the lever and see water on the moat rise up. Go left and see the floating bridge rise up. Walk across. Bolts puzzle: The object of the puzzle is to line up all the bolts in middle position. There are 2 panels (left and right) with 5 switches each. Each switch can be flipped right or left. 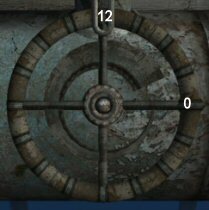 There are 10 bolts that need to be aligned at the center of the rods. Study which bolt is moved by which switch and in what direction. Deduce the correct sequence. Left panel: left, left, right, left, right. Right panel: right, left, left, right, left. If correctly done, the metal door with the bolts rises and entry to the central area of lowest level of the tower is now possible (which is the elevator when we first got here). Enter and the elevator automatically rises to the top level. Take the crystal. Go to the transporter at the other side of this level. Talk to Tamara. Why these traps? Stand on the teleporter. Tomb 35: The teleporter in the room at the lowest level is not activated. Go back up to the teleporter stand at top level and click the crystals collected on the waystone. See that 6 yellow circles are projected on the ceiling from the crystals. Go down to the room at the lowest level and see that the teleporter is now activated. Stand on teleporter. The crystal in this world is found inside the main building with the red framed door. This is the land of Tamara's adulthood. Look around the town. Go down to the lower level and peek through the gates. The town is in the middle of the prairie. See blue mice eating grains from a sack. See the area dotted with birdhouses. Some doors have keypad locks and areas not accessible - yet. Go to the main building with red framed door at the middle of the town. The ultimate aim at this Western town is to open this door. Panels: See 4 panels on the sides of the door. One panel is now open. The rest will open when the previous panel puzzle is solved. Each panel is made up of 2 sets of 4 wooden shapes in slots. The shapes can be cycled by clicking on them. Click on the red button to hear a bird sound. Bird houses: Around the town are birdhouses. They come in various shapes but some have duplicates. Some birdhouses have drawings on the posts that show similar shapes as that found on the door panel. Some of these posts with drawn shapes have buttons underneath them. Press the button and hear bird sounds. 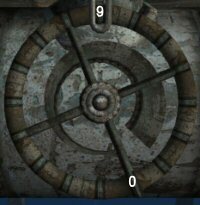 Closed sector keypad puzzle: The object of the puzzle is to find the codes to open the keypad locks. Find similar objects and listen to their sounds. Find the same sounds, associate them with symbols, figure the correct order and open door to the next sector. 1. The keypad locks are found beside a locked door to another area of town. Only one will be accessible at one time and that is the keypad puzzle to be solved. 2. Each keypad is made up of several glyphs. 3. Search for objects that has the same glyphs around that specific area. 4. These glyphed objects will produce sounds. Some of the other glyphed objects have similar sounds. 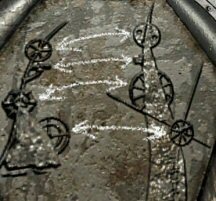 Take note or draw the glyphs on the objects that have similar sounds. 5. Note distinguishing features of the glyphed objects (like numbers, size, location) that will show the sequence. 6. 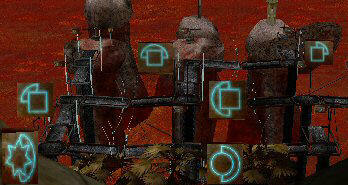 To open the door to the next sector, press the glyphs in a certain sequence on the keypad. 7. These keypad puzzles are random (Thanks, Jenny100). Turn left from the main building. Go forward to the door and see a keypad that is open. Look for objects that have similar glyphs. Turn right from the open keypad and go forward. Pass underneath the dragonfly and turn right at the end of the street. Go forward to the church. Enter and see cranks at base of the posts. Turn the cranks and listen to the sounds made. Make note of the glyphs of the posts with similar sounds. Then count the number of sides the posts above the identical sounding cranks have. Go to the open keypad and enter the 3 glyphs that have common crank sound. The sequence is based on the number of sides the posts above the cranks have. The door opens to another sector. See a keypad open on a red wall. This is the next keypad puzzle. Enter new area and turn right. See bells on both sides of the street. Ring bells and take note of the glyphs on the bells that made a common sound. Count the number of knots on the rope holding the bells. Go to the newly opened keypad at end of the street, left of a red swing door. Enter the 3 glyphs that have similar bell sound on the keypad in sequence based on the number of knots on the ropes. See another keypad open beside a brown door. Enter and see 7 barrels. Roll (push) the barrels to hear the sounds made. Note the glyphs on one side of the 4 barrels that have a common sound. Note the size of the barrels with the common sound. Go outside via the side opening and note the far birdhouse. Exit the barrel house. Go to the newly opened keypad. Go down the street with the bells. At the end of the street are steps. Go under the steps and go through the opening close to the wall. Go forward and right to the keypad. Enter the 4 glyphs from barrels that made similar sounds. The sequence is based on the size of the barrels. See another keypad opens - right of a glassed door. Enter, climb the stairs and listen to the sound of your footsteps. Take note of the 5 glyphs on side of the stairs that makes similar sounding footsteps. Take note that the last flight of stairs (separated by a landing) has 2 glyphs. At the attic, note the birdhouse close to the steps at one end of the room. Go to the newly opened keypad at other side of the main building at town square that has the panel-sound puzzles. Enter the building with open doorway right of the main building. Enter the 5 common footsteps glyphs on the keypad. The sequence is based from lower level to the top level. See another keypad opens beside a red framed door. Open doors throughout the building and make note of the glyphs on the doors that make similar sound when opened. You might need to back up to allow some doors to open. Go down the red stairs to an open air area. Note the birdhouse here. Enter the door into the next building. Turn right and see the newly opened keypad. Wait! We're not done yet. Go to the passage on the left and go out the door. Go back inside the building through a door at side of the building. Go forward through the building opening more doors. Go back to the newly opened keypad. Enter the 6 glyphs found on similarly sounding creaky doors. The sequence is based on the order the doors are opened. Enter and climb the stairs. Look at the birdhouses on this green painted balcony. Exit this area, back to the open air area and up the red stairs. Pass through the creaky doors and out to the main building. Time to do the panel puzzles. Panel-sound puzzle: The object of the puzzle is to find the correct shapes to enter. Listen to bird sounds from each panel. Find the birdhouses with the same bird sound and look for symbols plaque. 1. Press the red button to hear the sound that is needed to be matched. Try to remember or write down a composite of that sound. 2. Look for a birdhouse that has buttons on the post. Press the button to hear if the bird sound matches that of the panel being solved. Once found, make note of the drawn shapes on the post. Equally important, make note of the shape of the birdhouse itself. 3. Now, search for the duplicate birdhouse. Once found, make note of the drawn shapes on the post. 4. Go back to the panel puzzle on the door. Enter the 4 shapes found on the birdhouse with button on the top and enter the shapes found on the duplicate birdhouse at the bottom. 5. If done correctly, the panel closes and another panel opens. Press the red button, listen and take note of the bird sound. The birdhouse with button that matches the sound is found close to the town gate below the transporter. Press the button to listen to the bird sound. Take note of the shapes on the wood panel on the post and the birdhouse itself. The duplicate birdhouse to this one is at the back of town wall, end of the street right of the main building with the pane puzzles. Make note of the shapes on the wood panel on the post. Enter them on panel 1 of the red framed door. Solution below. The second panel opens and the first door of the entrance opens. The birdhouse with button that matches the sound of panel 2 is found at the top of the' footsteps on stairs' puzzle. Turn left, forward and go down the street with the bells. At the end of the street are steps. Go under the steps and go through the opening close to the wall. Go forward to the keypad and left to enter the door. Climb up the stairs to the top-attic. Press the button on the birdhouse close to the steps to check if this is the matching birdhouse. Take note of the shapes on the wood panel on the post and the birdhouse itself. Go down the steps and out of the building. Once out the door, go forward to the narrow alley and climb the stairs at the end. At the top of the stairs is the duplicate birdhouse. Make note of the shapes on the wood panel on the post. Enter them on panel 2 of the main building. Solution below. The third panel opens and the second door of the entrance opens. The birdhouse with button that matches the sound of panel 3 is found at the end of the street with bells. Press the button and listen. Take note of the shapes on the wood panel on the post and the birdhouse above. The duplicate birdhouse is found outside the barrel house. Make note of the shapes on the wood panel on the post. Enter them on panel 3 of the main building. Solution below. The last panel opens and the third door of the entrance opens. Press the red button, listen and take note of the bird sound. Listen carefully because the background bird sounds are similar to the puzzle sound. The birdhouse with button that matches the sound of panel 4 is found at the open air area of the creaky door puzzle. Turn right and enter the building. Go through the building, down the red stairs and see the birdhouse at the open air area. Press the button and listen. Take note of the shapes on the wood panel on the post and the birdhouse above. The duplicate birdhouse is found by turning left and entering the door. Climb the stairs and out to green painted posts on the balcony. Look at the birdhouse next to the green post third from the end. Make note of the shapes on the wood panel on the post. Enter them on panel 4 of the main building. Solution below. Enter the building and the elevator rises. Go around the corner, down the stairs and enter Tamara's home. Talk to Tamara and see circles spelling Ramirez' name on the wall. It is similar to the projected circles on the ceiling at tomb 35. Look around the house. Go back out, climb stairs and go around to the elevator. The elevator rises. Go around the corner and take the crystal. Go back out of the building and use the transporter. Waystone: Place the last crystal on the waystone at top level. See a building rise at bottom level. Go down. Bottom level: Enter the building, go forward and see faded pictures line the passageway. Podium: Climb the podium and look close at the last puzzle. Podium puzzle: The object of the puzzle is to enter something on the stone pads. What to enter? Tamara gave us the clue in her home. Ramirez wrote his name on the wall. Enter Ramirez on the stone pads. How? Study the name Ramirez wrote on the wall of Tamara's room or check the projection on the ceiling in the tomb. The podium setup has the spokes on the left and circle on the right. Balls come out from either side when a stone pad is pressed. Press each stone pad to see how many balls come out on either side. Correlate the stone pads' number of spokes and circles with the projection of Ramirez' name on the ceiling. Then press the keypads that correlate to letters of Ramirez' name.